The Defenders: Who Remembers Scorpio? Additional notes: The saga may actually have threads starting earlier (perhaps including #44 and 45) though the #46-50 is certainly sufficiently self-contained -- after all, #46 is titled: "Who Remembers Scorpio: Prelude". Written by David Anthony Kraft (with Roger Slifer, John Warner and Don McGregor). Art by Keith Giffen. Inks various. Ed. Archie Goodwin. Billed as "The Greatest Non-Team" in history, The Defenders was an odd-ball team before odd-ball teams were en vogue. They were supposed to be less a team than an informal association. Though critics tend to associate the group with charter members Dr. Strange, the Sub-Mariner, the Hulk, and the Silver Surfer (as witness some recent revivals) -- the Surfer was actually dropped early and, indeed, only the improbable Hulk (during his "Hulk smash puny humans" phase, that sublime mix of unrestrained hostility and childlike befuddlement) proved to be a stable member. Instead, largely original characters, or rather modifications of pre-existing characters, formed the group's true core: The stern Valkyrie who seemed to be there as much because she had no where else to go (and who started out as a villain, but somehow evolved into a hero in the late '70s), the happy-go-lucky Hellcat who seemed as much in-love with the idea of being a super hero as anything (and who had spent the '50s and '60s as Patsy Walker, Marvel's female Archie Andrews, before entering the ranks of superherodom with a costume which had previously been worn by an early '70s heroine, the Cat) and Nighthawk, a reformed villain who seemed the most "normal" of the bunch. Just describing them makes the book sound...odd. Other characters that came and went included Luke Cage, Devil Slayer, Red Guardian (II), and hangers on like Jack Noriss. At its best, it was the series' treatment of the characters that made the The Defenders work. While The Uncanny X-Men and The New Teen Titans won praise for their female heroes, the morose Valkyrie and guileless Hellcat are intriguing female characters precisely because they don't fall into convenient female archetypes -- they're people first. The team also had an appealing self-knowledge that they were a low-rent version of the Avengers. Not that the Defenders couldn't necessarily match the Avengers for power, but while the Avengers had their Fifth Avenue mansion, the Defenders held meetings in Dr. Strange's living room, or a rural riding academy. While the Avengers had those fancy Quinjets, the Defenders sometimes had to struggle to find cab fare. While the Avengers had a nifty battle cry, the Defenders...didn't. Those four, Nighthawk, Hellcat, Valkyrie and the Hulk, along with temporary roster addition Moon Knight, are at the core of what is, arguably, the series' most memorable epic: "Who Remembers Scorpio?" While the Defenders try to adjust to a sudden halving of their membership, witer David Anthony Kraft (aided and abetted by the likes of Don McGregor and others) reintroduces an old Nick Fury villain, Scorpio, who's been holed up in a New Jersey warehouse for seven years working on his next big scheme. The saga is at once humorous and brooding, mixing colourful comic book action and unusual plot twists with introspection and strange philosophical monologues. Some of the conversations between Scorpio and Jack Noriss (whom he's kidnapped) -- conversations about abuse of power, alienation, etc. -- are genuinely the stuff of literature. At the saga's heart is Scorpio, who's at once abhorrent but also curiously sympathetic. Supremely arrogant, yet plagued by self-loathing; ruthlessly amoral even as he's convinced that he acts for the betterment of humanity; obsessed with his grand scheme but frets when he runs low on beer. Scorpio is essentially a manic depressive and he emerges in these five issues as perhaps the most intriguing, most complex villain to ever grace a four-colour page. Before or since. All this for a guy who (I'm assuming) was a pretty minor, one-dimensional punching bag when he used to fight Nick Fury. And Scorpio's relationship with a mysteriously passive Fury also adds to the saga's underlying emotional power. The story's full of (intentionally) goofy action and larger-than-life heroics -- like a quirky, but oddly suspenseful, scene where the heroes have to rile the Hulk into helping them...and riling the Hulk isn't something you want to do without a hefty life-insurance policy. It has witty dialogue, self-reflective humor, and character interplay that made the Defenders, at their best, an unusually believable group with unusually believable personalities. And a quirky group, too. This was a comic that, when advertising the next issue, would include among its listing of exciting things to come such non-events as "Hellcat's Coffee-Making Catastrophe!" It's not hard to see in The Defenders an anticipation of Grant Morrison's tenure on The Doom Patrol -- only 15 years earlier! It's this contrast of the light with the somber that makes "Who Remembers Scorpio?" stand out. The final issue is a rollicking, witty action piece as the Defenders tackle a "new" Zodiac gang...but given a poignant twist or two, particularly in the final two pages chronicling Scorpio's melancholy end as he contemplates the ruin, not of his plan, but of his very dreams. Those two pages are among the most memorable I've ever read in my many years of reading comics. Artist Keith Giffen was going through a Jack Kirby phase (particularly noticeable with frequent Kirby inker Mike Royer doing some of the inks) that is actually kind of appealing -- a restrained Kirby with a touch of early Steve Ditko panel arrangements. But more brooding than either gentleman. Kirby for those not big on Kirby. Kraft tried to continue his exploration of big philosophical themes mixed with superhero antics in his next Defenders epic, "The Power Principle" (Defenders #52-56), but, though not uninteresting, it didn't come together as well. So "Who Remembers Scorpio?" -- a lot of people who read this, given the times I've seen it crop up on "classic" story arc lists. 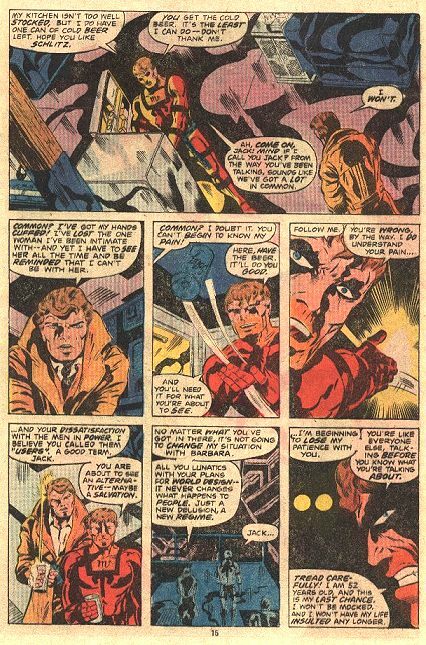 Click here for a page from Defenders #48 between Scorpio and Defenders sidekick Jack Norris (with probably more than a little of Don McGregor's influence in the dialogue).